Stump removal is a very challenging and demanding step of the tree removal process. When it comes to removing tree stumps, your standard tool shop inventory just won’t get the job done, no matter how many guys you have on hand. It requires professional equipment, training, and technique to safely and efficiently remove a tree stump. Clearing old tree stumps is beneficial to property owners because it allows for future gardening, tree planting, landscaping, and construction plans. Not only is this advantage liberating, it is economical and potentially profitable since unsightly tree stumps diminish property value and practicality. At Complete Tree Care, our professional tree specialists provide stump removal services, including stump grinding, at the most competitive prices in Central Indiana. We retain quality equipment and extensive training, which allows us to effectively remove tree stumps safely. Whether commercial or residential, our professional tree technicians are fully-equipped and eager to get the job done right! 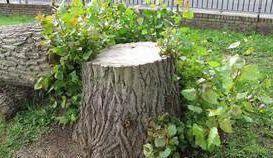 Call us today at 317-783-2518 when you need professional tree stump removal and stump grinding services in Indianapolis and its surrounding neighborhoods. Call Complete Tree Care at 317-783-2518 for Stump Removal and Stump Grinding in Indianapolis!